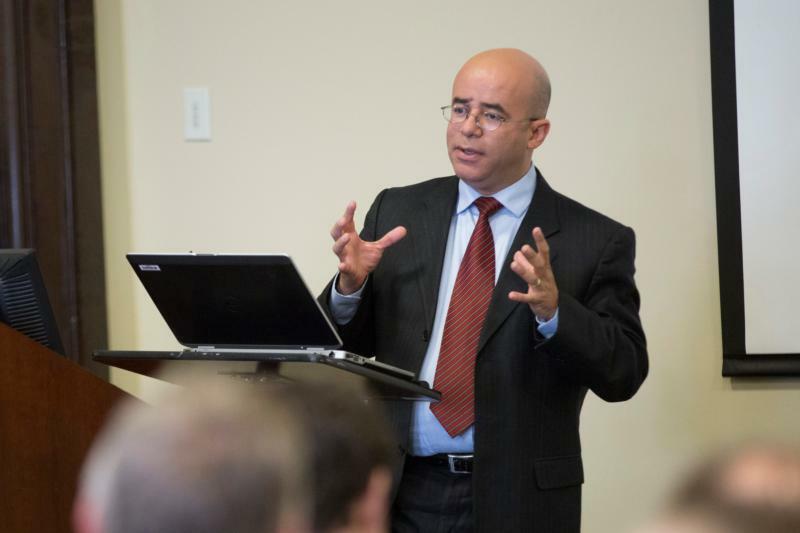 WASHINGTON (CNS) — Hispanics in the Catholic Church are not a problem to be solved, but a blessing and an opportunity, said Hosffman Ospino in a Jan. 30 talk at The Catholic University of America in Washington. The growing number of U.S. Hispanic parishioners puts a new face on the church, forces it to renew itself, pushes it to redefine its commitment and presents dioceses with a challenge, he said. Ospino is a professor of theology and religious education at Boston College and director of graduate programs in Hispanic ministry there. He is well-known as a leading voice in Hispanic ministry and theology. Hispanics are the fastest-growing community in the U.S. They make up the largest minority group in the country and, according to the U.S. Census Bureau, they will surpass the 132 million mark by 2050. By then, Hispanics will represent 30 percent of the nation’s total population, according to data from the U.S. Conference of Catholic Bishops. Immigrants bring along families, friends, talent and treasure, he said. They form groups that adapt to faith communities, thus nurturing the church. “They look for places to live, opportunities for advancement, and [they] did not cross the border, for the border crossed them,” Ospino said. Ospino also mentioned the Fifth National Encuentro on Hispanic/Latino Ministry to be held in September 2018 in Fort Worth, Texas. It will be the culmination of parish, diocesan and regional encuentros, in which the U.S. Catholic bishops anticipate more than 1 million Catholics participating over the next two years. “We become the church we serve, that’s why the U.S. church has become a Hispanic church,” said Ospino, who is a new columnist for Catholic News Service. His monthly column, written in English and Spanish, is titled “Journeying Together/Caminando juntos,” explores topics of interest to both Hispanic and non-Hispanic Catholics. Latino Catholics represent 71 percent of the country’s Catholic growth. During the 1960s, 10 percent of Catholics identified themselves as Hispanic; today approximately 30.4 million people in the United States self-identify their religion as Catholic and their ethnicity as Hispanic or Latino. Ospino explained that growth comes from the nation’s Southern and Western region. He said 38 percent of parishes with Hispanic ministry are located in the South, and 23 percent are in the West. Catholic Hispanics are throughout the nation, but there numbers are growing in places such as Hawaii and Alaska, he said, adding that Canada, too, is seeing growth in its Hispanic population. Catholic education is key to passing on the values of the Catholic faith values to succeeding generations and strengthening those values. Ospino urged school construction where Hispanics live. “It’s a unique opportunity to build and rebuild the church,” he said. He also cautioned that because Hispanic Catholics have switched to other religions, the church cannot take it “for granted that Hispanics are to continue in Catholicism.” “The church’s present and future depend on them, so it’s important to redefine pastoral plans and commitments” to serve Hispanics, he said. The National Catholic Educational Association reports that 15.3 percent (296,903) of students registered for the 2014-15 school year were Hispanic. That means that from the total school-age Hispanic population (12.4 million nationally), just 2.3 percent attend a parochial school. So 97 percent of school-age Hispanics grow up in a Catholic home but do not benefit from a Catholic education. “Only 10 percent of those registered in Catholic universities are Hispanic,” Ospino added. In the face of the booming Hispanic population, the church is called to offer Catholic education to that population, he said. Acknowledging the cost of Catholic education and the closure of numerous Catholic schools because of a lack of resources, Ospino said one solution is more lobbying for a tuition tax credits to help families meet those costs. Saying the Hispanic church is the present and future, Ospino said church leaders should pay attention to where Catholicism is growing. Statistics show that more than most other groups in the church, Hispanics as a group baptize their children and see that their children receive first Communion, but at the same time church ministry shows resistance to that reality, he said. “There’s a lot of energy and possibilities among immigrants,” said Ospino, referring to Hispanic youths. Hispanic immigrants’ average age is 28 years. About 60 percent of Catholics under 18 are Hispanics. Ninety-three percent of them were born in the U.S. and are not committed to the church life. “We have to change the concept from a church that serves Hispanics to a church that is Hispanic, because Hispanics ‘are’ the church,” remarked Ospino.